Not too long ago, Laura posted about her Top Three picture books, and I thought I would chime in. I was also intrigued by Laurie's post on Top Three Speculative worlds, but my favorites are so predictable--Narnia, Rivendell and Hogsmeade--that I thought you might be more interested in my picture book choices. 3. What Do You Do with a Kangaroo? 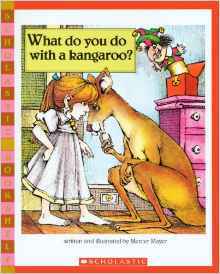 Also by Mercer Mayer, one of Laura's author picks, this book was one of my childhood favorites. A sassy girl in bell bottoms is harassed by a menagerie of demanding animals who interrupt her daily schedule. I love the illustrations and I can relate to her dilemma. What do you do when a "grown Bengal tiger with flashing green eyes" is sitting on your "red-painted tricycle seat?" You can view the pictures and have the book read to you by a gentleman with a delightful Australian(?) accent here: What Do You Do with a Kangaroo? Can you find the kitty in most of the pictures? 2. 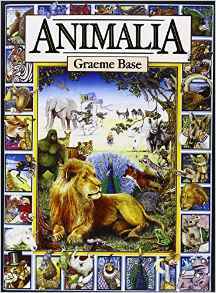 Animalia by Graeme Base is a sophisticated alphabet book in which Base uses alliteration and paints fantastic images of all things ordinary and fantastical beginning with each letter of the alphabet. The "D" page highlighted on Base's author page is one of my favorites. "Diabolical dragons daintily devouring delicious delicacies." Indeed! 1. 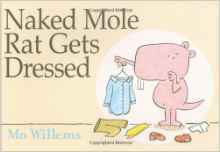 Naked Mole Rat Gets Dressed by Mo Willems. This hilarious book was the source of much consternation in my life as a mom. Thankfully, my children are old enough now to laugh at the book's message and not take it literally. However, a mischievous auntie gave my youngest the book several years ago. Since my youngest was just a toddler then, she spent a happy aisle or two in the grocery store with her sweatshirt around her waist. When I realized why all the other people in the store were laughing as they passed us, I asked her to pull her shirt up. Unfortunately, she exclaimed, "No! We be naked!" Mortified at the time, I now think the book is fabulous, and makes a great gift. (Here is a handy Amazon link)! Fun Note: Did you notice all these books are technically fantasy books? What are your favorite fantasy picture books? These are some good ones, Erin!